As the holidays approach, one thing is certain: the weather is going to get colder before it gets warmer again. While sensible folks stick to winter sports like skiing or head to their indoor gyms, we cyclists just carry on like nothing has changed since July. We might have to add on a few more layers of clothing, a rain jacket, tights, booties, hats, scarves, and a couple of pairs of gloves, but a blustery Saturday morning is as good a day for a ride as any, right? Right. Winter weather does change our cycling habits. Every experienced cyclist has a preferred method of staying warm, dry, and comfortable. Here we'll try to outline a few of the products that can help keep your winter riding warm and enjoyable. Your jacket is your first line of defense from the elements, protecting your core from water, wind, and more. Cycling shells are made with a variety of different features to suit particular weather conditions. Many manufacturers claim that their jackets are breathable, windproof, waterproof, and lightweight, all at the same time—in reality, no jacket is going to be everything to every rider. A truly waterproof jacket often lacks breathability, while a very breathable jacket will suffer in terms of water resistance and warmth. Waterproof and windproof panels tend to lack elasticity, which may limit range of motion. Very durable jackets tend to be heavier than others. It's best to carefully consider the conditions in which you'll be riding and make a decision based on the features that are most important to you. If you live in a wet climate like we do, a good waterproof rain jacket is essential. We love the jackets made by Showers Pass, which like BikeTiresDirect.com is based in the Pacific Northwest—where we know all about rain and waterproofing. The Showers Pass Men's Elite 2.1 Jacket is our favorite seriously waterproof jacket for serious wet-weather rides and commutes. It's thoughtfully designed for cycling use—longer in the back and sleeves, with carefully-placed vents that allow air flow without letting water in. If rain is less of a concern, a softshell jacket may be more comfortable. 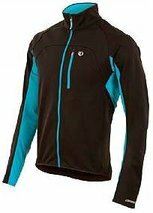 With plenty of warmth, flexibility, and wind-resistance, a choice like the Pearl Izumi 2015 Men's Elite Softshell Jacket will keep you comfortable in a range of conditions, including some more mild rain. Jerseys are versatile. If it's really cold out, layer up and pile on two or three. A medium-weight long-sleeved jersey like the Pearl Izumi 2015 Women's Select Long Sleeve Jersey or our BikeTiresDirect Team Winter Jersey will be your favorite article of clothing by the time spring rolls around again. A summer-weight jersey worn underneath your long sleeve can help take the chill off the coldest rides—and if you get too hot, it's easy enough to carry with you. When you're trying to most effectively keep your house warm in the winter, do you build an elaborate wind screen and a new roof, or do you add insulation? A baselayer is your primary source of insulation in winter. It holds the heat that you generate close to your body, where it can keep you warm. A good winter baselayer will wick sweat away (to prevent evaporative cooling) while retaining heat. The Castelli Men's Iride Long Sleeve Baselayer is a good example of a winter baselayer that will keep you comfortable in chilly temperatures. We're also fans of merino wool baselayers like the Icebreaker Women's Oasis Crew Long Sleeve Baselayer-merino is an incredible natural performance fiber that insulates superbly even when wet and wicks sweat as well as most synthetics. Your worn-out cotton gym shirt is not a baselayer—avoid cotton at all costs. Cotton absorbs moisture and becomes a cold, damp rag clinging to your skin. Not the way to keep warm! A good pair of tights can simplify your wardrobe and make your winter riding much more comfortable. Tights and pants face similar limitations to jackets, in that weather resistance and breathability are somewhat mutually exclusive; you need to find a balance between the two that suits your typical riding conditions and your riding style. Cycling pants, like the packable Showers Pass Men's Storm Pant, are usually designed to be worn over your shorts (or even street clothes). Tights, meanwhile, come either with or without a chamois. No chamois = wear with your shorts, chamois = wear alone. The Pearl Izumi 2015 Men's Elite AmFIB Cycling Bib Tight is a high-performance bib tight with a high-performance chamois, perfect for wet and windy days, while the easy on/off Vermarc Super-Roubaix Double Zip Warmup Tights fits over your favorite shorts and helps to cut wind chill in drier weather. On cold rides, your hands are usually the first part of you to feel the chill—and as your hands get cold and stiffen up, your ability to shift, brake, and steer your bike can be seriously impaired. Big time safety hazard! Stay safe and cozy with a pair of good gloves. The waterproof Giro Pivot Winter Glove or the neoprene Castelli Men's Diluvio Glove will keep your fingers warm and functional. On particularly cold days, you might consider adding a glove liner like the Wigwam Thermolite Glove Liner. Cycling gloves generally skew more to the breathable side of the weather-resistant spectrum, though some are more waterproof than others. If you're having trouble keeping your hands dry in particularly nasty conditions, it'd be best to pick up some waterproof shells from your local outdoor store to wear over your gloves. Your parents always told you to wear a hat, and they were right. It's important to keep your ears covered on a cold ride. You'll lose a lot of heat with exposed ears! The stretchy, snug-fitting Castelli Viva Thermo Skully Hat won't bunch up underneath your helmet. We also like the Pearl Izumi Thermal Headband, which keeps us cozy in Portland's fairly mild winters. To block a little extra wind and water, consider a helmet cover. All those vents in your helmet are great in the summer, but in the winter they're more of a liability. A cover like the Showers Pass Helmet Cover can go a long way towards keeping you comfortable. Slippery road shoes can be even more so in winter, plus they are often designed with summer rides and ventilation in mind. For this reason, even dedicated roadies often turn to mountain bike shoes in winter-their treads are safer on wet surfaces, and they tend to be less vented, since vents let in mud and dirt. Alternatively, a good shoe cover will warm up your shoes and help keep your feet dry. Toe covers will block a little bit of chill, while full booties like the neoprene Louis Garneau Neo Protect Shoe Cover or the waterproof Pearl Izumi 2013 P.R.O. Barrier WxB Shoe Cover will keep your feet warm and dry in harsher conditions. If training comfortably outside in the winter is a very high priority, consider a pair of winter boot-style shoes, designed for comfort and performance in cold conditions. The Sidi Hydro GTX is a high-performance choice. As far as socks go, again avoid cotton, which doesn't insulate when wet. Wool is a great choice, and your regular synthetic cycling socks will work fine, too, if your shoes are warm enough. We like thick and comfy DeFeet Woolie Boolie 4 Inch Socks. As experienced year-round riders and commuters, we'd love to help you find the gear that will keep you on your bike all through the winter. If you have any questions, please contact us at 1-800-682-0570 or [email protected].